Citing a spike in congressional requests and a declining budget, the inspector general for the Environmental Protection Agency informed Congress on Friday that he has ended the office’s multiple investigations into reports of misconduct by former Administrator Scott Pruitt, who resigned in July under a cloud. Sheehan credited the work to his predecessor Arthur Elkins Jr., who retired in October. 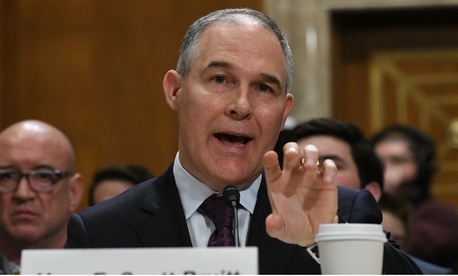 The IG’s team had also investigated whether Pruitt improperly pressured staff to “render opinions” on his questioned lodging arrangements during travel, but that allegation “was not supported,” the report said. Before cancelling the work in the wake of Pruitt’s departure, the IG released two key audits, the report noted. “While assessing the administrator’s use of hiring authorities under the Safe Drinking Water Act, we found that six employees received substantial pay increases along with conversions of their positions.” The IG issued a management alert on this finding. The IG’s audit of Pruitt’s Protective Service Detail found that the agency had no approved standard operating procedures addressing the level of protection needed or how it is provided.